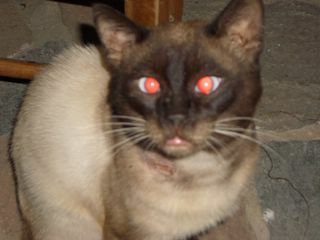 www.oneninesixnine.com: Cross Eyed Cats ROCK!!! I know that this picture is not clear, and that I am easily pleased, but please tell me that this "Cross Eyed Cat" is not the funniest thing that you have ever seen. Just for the record, it does not have red eyes as well, that is purely my inability to take a photograph.